Is there a way to display named ranges with a space? 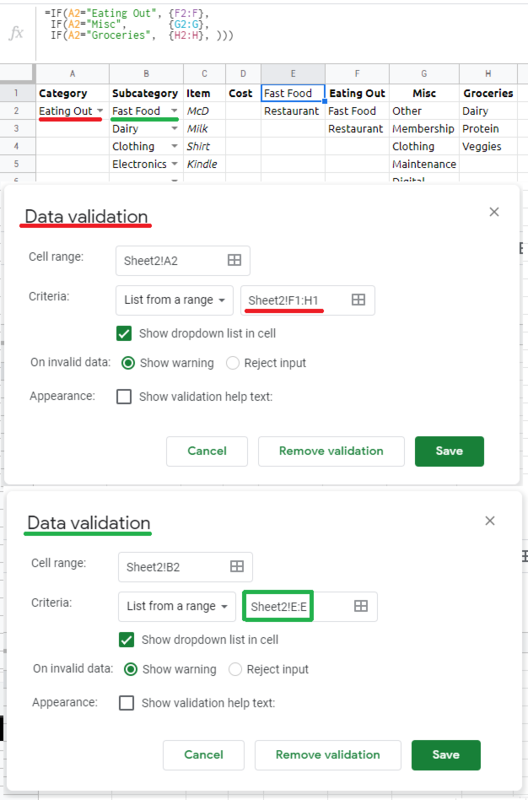 In the spreadsheet, there is a dependent drop-down list in the first column, which automatically populates a data validation for the second column using the named range from the first column. This works fine, but any named range with space (e.g. Eating Out) has to be displayed as (Eating_Out or Eating.Out) since named ranges do not accept spaces. Is there any sort of workaround for this? No, there is no workaround for getting a named range with space. Can contain only letters, numbers, and underscores. Can't start with a number, or the words "true" or "false." Can't contain any spaces or punctuation. Can't be in either A1 or R1C1 syntax. For example, you might get an error if you give your range a name like "A1:B2" or "R1C1:R2C2." Not the answer you're looking for? Browse other questions tagged google-sheets formulas google-sheets-named-ranges google-sheets-data-validation or ask your own question. Is there a way to limit a column's data to a list in Google Spreadsheets? Multiple Conditions on a CountIF? Is it possible to create a Named Range that is the union of two other Named Ranges?